One of the oldest & traditional ways of fire protection, which is water based protection system, is in the form of automatic sprinklers. Heba India can provide you with complete designing of sprinkler system for any kind of hazard. Our design facility also has the provision for calculation of water demand using latest licensed hydraulic calculation software’s which will accurately determine the water demand as per the standards. Various sprinkler system network designing can be done to cater the specific needs of the customers varying from residential to commercial and industrial. Depending on the type of hazard, different varieties and sizes of fire extinguishers are located per standards which form typical manual fire protection systems. Also semi automatic water based systems are classified as manual fire protection systems. In this case the water under pressure will be available in the pipe line. The valves (normally with 1.5” outlets within the building) have to be opened & hoses pulled down to fight the fire. The landing valves & fire hose cabinets are provided for the use of occupants to fight small fires. Hydrants (normally with 2.5” outlets located outside the building) & fire hose houses are provided for the usage of trained fire fighters. These are the most common but effective systems which we design on daily basis per standards & using hydraulic calculations. For all water based & foam based, automatic or semi automatic fire protection systems the water will be available under pressure at all times. This is achieved by providing fire pump set and water tank, all inter connected. Generally there will be an electric motor driven main fire pump, the size (flow & pressure) of which is based on the highest demand from hydraulic calculations. There will be a stand by Diesel engine driven fire pump of same capacity for emergency purpose. Additionally there will be a pressure maintaining device also called as a Jockey pump whose pressure rating will be equal to that of the main pump but with a very low flow rate. Other mandatory accessories will all be fitted together & the inlet connected to a dedicated fire water tank. 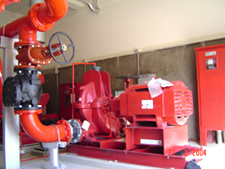 The capacity of the tank depends on the hazard nature which defines the time period required multiplied with the flow of the main fire water pump. All of these again needs experienced engineers to design an optimum package meeting the standards, yet economically viable. The team at Heba India has this in abundance with right tools to execute in a very quick time.